[Episcopal News Service] President George H.W. Bush, a lifelong Episcopalian who credited his faith with shaping his public life, will be memorialized Dec. 5 at a state funeral held at Washington National Cathedral, the Episcopal Church’s and the nation’s most prominent house of worship. Bush, who died Nov. 30 at age 94, had a long, respected career in Washington, D.C., including as vice president from 1981 to 1989 and president from 1989 to 1993. During his 12 years in the White House, he engaged often with Episcopal Church leaders, conferring with presiding bishops on the issues of the day and even once speaking at General Convention. 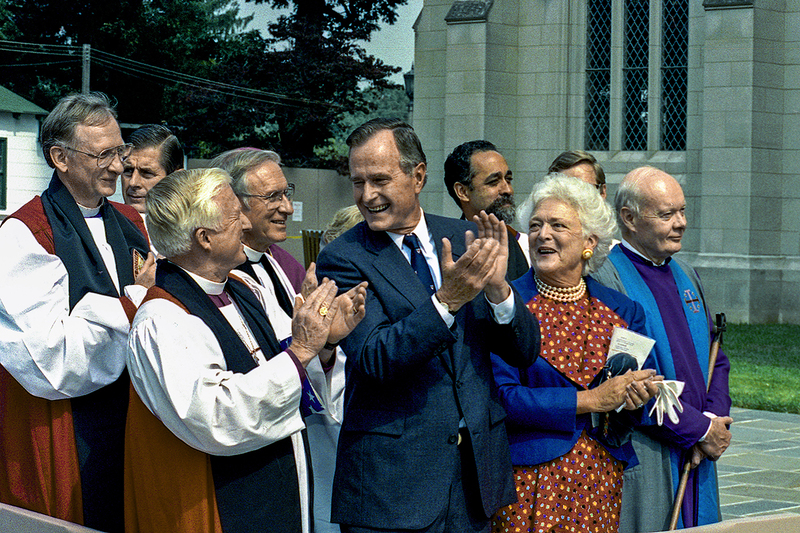 He also developed a friendship with former Washington Bishop John Walker, and as president, Bush and first lady Barbara Bush attended the 1990 ceremony marking completion of the cathedral after 83 years of construction. Today, two of his children are members of the cathedral congregation. The 11 a.m. service Dec. 5 with be the fourth presidential funeral held at the cathedral. The family selected as officiants Presiding Bishop Michael Curry, Washington Bishop Mariann Budde, the cathedral’s Dean Randy Hollerith, and the Rev. Russell Levenson Jr., rector of Bush’s Houston congregation. Levenson also will preach at the service. The president’s son, former President George W. Bush, will be among the eulogists at the funeral. 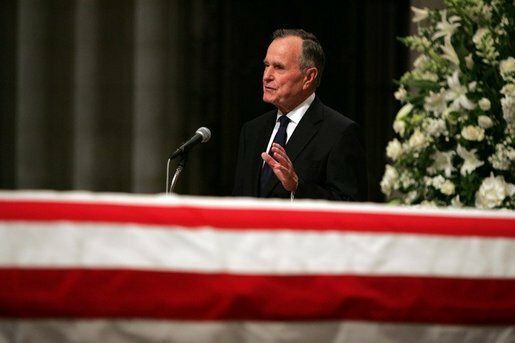 The others will be former Canadian Prime Minister Brian Mulroney, former U.S. Sen. Alan Simpson and Bush biographer Jon Meacham, according to the order of service. In addition to the late president’s son, Presidents Donald Trump, Barack Obama, Bill Clinton and Jimmy Carter are due to attend the funeral, as well as German Chancellor Angela Merkel, CNN reported. The service is expected to draw a capacity, invitation-only crowd of up to 3,000 people, including family members, senators, representatives, Supreme Court justices, Trump administration officials, diplomats and foreign dignitaries, with U.S. Secret Service establishing security protocols, cathedral spokesman Kevin Eckstrom told Episcopal News Service. “Easter and Christmas, as complicated as they can be, feel pretty routine compared to something like this,” Eckstrom said. The last funeral at Washington National Cathedral to approach such significance was the service for U.S. Sen. John McCain on Sept. 1. But a state funeral is an honor reserved for presidents, part of a series of tributes coordinated by the U.S. Department of Defense as a final sendoff for the former commander-in-chief. The previous three state funerals at the cathedral were President Dwight Eisenhower in 1969, President Ronald Reagan in 2004 and President Gerald Ford in 2007. Bush gave eulogies at Reagan’s and Ford’s funerals at the cathedral. President Woodrow Wilson is entombed at the cathedral, but his 1924 burial service was not a state funeral. ABC has long been the TV network designated to provide the pool feed for high-profile events like this at the cathedral, and by Dec. 3, the network had three tractor-trailers filled with equipment on the grounds in preparation. The cathedral staff is mobilizing to complete its part of this multilayered puzzle of preparations, such as printing about 5,000 leaflets with the order of service and ensuring they are delivered before the Secret Service closes the building for a security sweep. Eckstrom said the funeral will adhere closely to the Book of Common Prayer, and the hymns will be familiar to anyone who picks up The Hymnal 1982 from the pew in an Episcopal congregation each Sunday. “This [state funeral] probably has more of an Episcopal flavor to it than some of the others might,” he said, given Bush’s Episcopal faith. As a child in Connecticut, Bush attended Christ Episcopal Church in Greenwich, and his mother would read to him from the Book of Common Prayer, according to the Washington Post report on his faith. “He was Episcopalian by tradition. His mother was extremely devout, read all the books. And he loved his mother and so he loved the tradition,” author Doug Wead told the Washington Post, adding that Bush also pointed to his service as a naval aviator in World War II as pivotal to his faith development. After moving to Texas as an adult, Bush at first attended a Presbyterian church with his wife before the couple settled in Houston and joined St. Martin’s Episcopal Church. As vice president, Bush met with Episcopal leaders, including Presiding Bishop John Allin, who in February 1982 raised concerns with him about a recent postage rate hike. 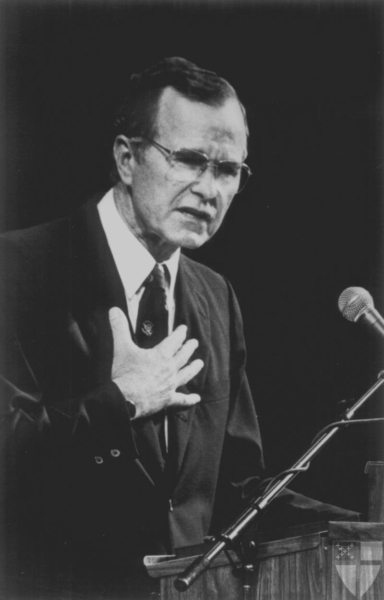 Later in 1982, when Bush addressed the Episcopal Church’s General Convention in New Orleans, the speech reportedly proved controversial for its remarks in defense of the Reagan administration’s arms policy. “Vice President George Bush assured nearly 3,000 of his fellow Episcopalians of governmental desires for peace as he addressed a special session of the 67th General Convention of the Episcopal Church,” the caption said on an archival photo from that speech. As president, he attended services at St. John’s Episcopal Church, across Lafayette Square from the White House. In December 1990, during the run-up to the Persian Gulf War, he met with then Presiding Bishop Ed Browning, who recommended restraint. “I really believe in the deepest part of my conviction that God does not desire this kind of destruction,” Browning said, according to an Associated Press report at the time. Bush countered by presenting an Amnesty International report on atrocities by Iraq against Kuwaitis and asked Browning if doing nothing would be morally worse. “His own faith was sincere and deep and rooted in the Episcopal Church,” Budde told ENS in an interview. She also referenced correspondence she discovered between Bush and Walker, including letters in which the bishop and the vice president debated the proper way to respond to apartheid in South Africa. Bush “was a good colleague, I would even say friend, to Bishop John Walker. Their tenures coincided,” Budde said. Walker served the Diocese of Washington until his death in 1989. Bush will be buried after a private service scheduled for 4:15 p.m. Dec. 6 at the George Bush Presidential Library & Museum in College Station, Texas. Barbara Bush, who died April 17, was buried there earlier this year after a funeral attended by a crowd of mourners at St. Martin’s, the largest congregation in the Episcopal Church. The Bushes were married 73 years. St. Martin’s also is scheduled to hold a funeral service for the former president at 11 a.m. Dec. 6 after his remains are returned to Texas. First, he will lie in state at the U.S. Capitol through the day on Dec. 4. On Dec. 5, the casket will leave the Capitol in time for the funeral at Washington National Cathedral, which will air on all major broadcast TV and cable news networks and will be livestreamed by various websites, including C-SPAN. “Through his enduring commitment to public service and his steadfast devotion to his family, he lived the way of Jesus through a life shaped by faith, hope and, above all, love,” Curry said in a tribute to Bush issued Dec. 1. “Through his unswerving service to our country and to the human community around the globe, he embodied the noblest ideals of his faith and his country. The post Bush remembered as lifelong Episcopalian with deep ties to his church appeared first on Episcopal News Service.